On the top of Wildenburg Mountain (Wildenburger Kopf), one of the highest peaks of Wildenburg Ridge at 675 m, stood an important Celtic refuge with a double ring wall during the Latène Age (3rd century B.C.). Together with the grounds further west near Otzenhausen and on Ringskopf mountain, as well as the "Altburg" fortress further east near Bundenbach, this formed an extensive defence system for the Celtic tribe of Treverians. The key strategic importance of Wildenburg for those times becomes clear when you stand on the platform of the observation tower and enjoy the sweeping panoramic views —an extremely rewarding outing at any time of year and in any weather. To the north you can see the Eifel region and the Ardennes, to the east the Taunus region, and in the southeast the prominent massif of Donnersberg mountain. At 687m, Donnersberg is the highest point of the Nordpfalz Region, on whose summit plateau the third largest Celtic "oppidum" of central Europe can be found, with an 8.5km long system of ring walls and an enclosed area of 240 hectares. By contrast, with an area of 6 hectares, the dimensions of the Wildenburg refuge (whose largest dimensions were 300m by 220m) were quite modest, yet for the Hunsrück region it represented a typical size of Celtic castle. In fact, thanks to the prosperous economy, the economic and social system of the Celts of the Latène Age developed into an early urban form of society; the so-called Oppida Civilization. Typical of this civilization in Caesar's time was a form of settlement, which consisted mainly of individual farmsteads (Latin: aedificia), unfortified villages (Latin: vici), and fortified towns (Latin: oppida). After Caesar conquered the Gauls (58-51 B.C.) and subjugated the Celtic tribe of Treverians, a Roman mountain temple appeared on the top of Wildenburg. It is unclear whether the Celtic castle was still being used at the time of the Roman conquest. Around the year 350 AD a Late Roman fortification was built on Wildenburg where it stood for a short time. Wildenburg gets its name from the Wildgraf (nobleman with the status of Earl) Friedrich von Kyrburg from Kirn on the Nahe River, who, in the year 1328, built a small castle on an exposed spur on the top of Wildenburg Mountain. In the process, a substantial part of the Celtic ring walls were dismantled and used as a stone quarry. Its exposed position meant that the only easy approach to the castle was from the heights of the mountain ridge, so that two man-made moats were enough to defend it. These were hewn into the rock at a 10m distance from each other and still visible today. A wooden bridge was the only way over the moats to reach the castle, and this was burned down by Lorraine troops in 1651. Later it was partially reconstructed, and in the year 1660 the lower part of the castle served the bailiwick of Wildenburg as its administrative centre until the county was abolished in the year 1792. 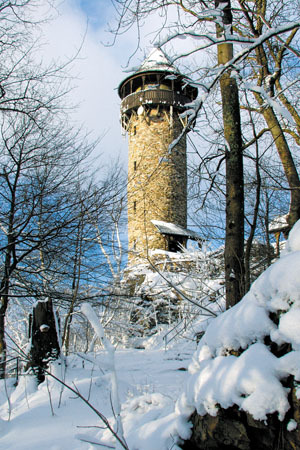 Today a 22m high observation tower, which was erected by the Hunsrück Society (an association for the advancement of cultural heritage), stands on the rocky spur on top of Wildenburg mountain. At the foot of the castle hill, on the medieval foundation wall of the lower part of the castle, a country style restaurant has-been built. An "historic" learning trail leads through the three thousand years plus of human history of this area. In addition, a newly established "forest adventure trail" will enthral adults and children alike. This 3.5 km long circular path through the woods around Wildenburg allows you to see at firsthand how a forest renews itself naturally. Much interesting information can be discovered here: for example identifying characteristics of trees, the location of wild animals, and how charcoal used to be made. If you prefer longer, more varied walks, you will be fully rewarded here. How about a trip past the Wildenburg ridge, towards the East to Mörschieder Burr (646m), to see the Härtlingsrücken made of weathered Taunus quartzite? Or you can go in the opposite direction down the Idarbach creek valley to Katzenloch, and from there to the massive rock wall of the Kirschweil Fort on the Silberich (623m). From the Silberich you can go via the ridge to the Celtic ring wall system on the Ringskopf (650m). This mountain plateau affords a clear view over the Hunsrück ridges, and it is not far from here down to Allenbach.